100 years ago, our founder Eglantyne Jebb changed the course of history when she declared that all children have rights. This revolutionary idea became the UN Convention on the Rights of the Child and sparked a global movement – one that continues to build through the work of all who strive to make the world a better place for children. Save the Children turns 100 in 2019. Over the last century, we’ve helped to significantly improve the lives of children. But in a world where millions of children continue to die from preventable causes, miss out on learning and are subjected to violence, we are impatient for change. Our 2030 strategy, Ambition for Children, sets out what we want to achieve for the world’s most deprived and marginalised children. Our 2019-2021 plan describes the next steps we will take to close the gap for those children, bringing us closer to our founder’s vision. In 2016, we launched our first global strategy as one Save the Children. Our 2016-2018 work plan, the first phase of our strategy, showed us how much stronger we are when we work as one. We focused on improving the quality of our programmes, capturing what we know works for children, and improving systems to help us deliver more efficiently. Now, we are building on what we’ve delivered and learned along the way. The world has changed for children and for our organisation in the past three years: we’ve better defined which children are the most deprived and marginalised across our work; we have responded to major humanitarian crises; we’ve recognised the need to continually evolve to stay relevant in a changing donor and partner landscape; we’ve faced growing demand for greater transparency and demonstrable impact; and we have seen how social and political changes are shaping the world for children. In 2019-2021, we will write the next chapter in Save the Children’s history. 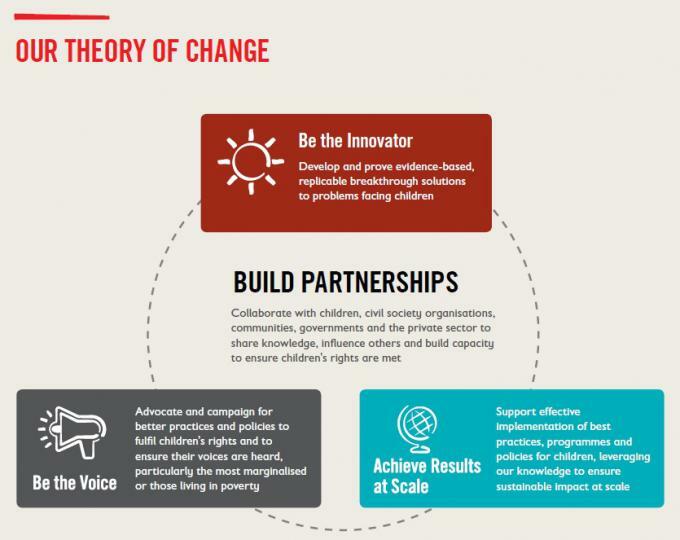 We will maximise our impact for children by putting our Theory of Change into practice in 120 countries. We will work for and with children on health and nutrition, education, child poverty, child protection and child rights governance across all contexts. And we will make it happen with the invaluable efforts of our partners, volunteers, supporters and 25,000 colleagues across the globe. 2019 , a special year for the Save the Children movement – In 2019, we will mark 100 years since Save the Children was founded. We will also start our next three year global plan, to accelerate on our breakthroughs by 2021, for the most deprived and marginalised children; ensuring every last child is able to survive, learn and be protected. The reason we were founded - Our extraordinary story began in 1919, when our founder Eglantyne Jebb launched the pioneering fight to save suffering children across war-torn Europe, which inspired the first global movement for children. 100 years later Save the Children continues to lead the way in the spirit of Eglantyne; being bold, courageous and compassionate as we take a stand for the rights of children worldwide. We work in Nicaragua for a continuous period since 1986, although we support Nicaraguan girls, boys and adolescents after the 1972 earthquake in Managua. Save the Children’s work in Nicaragua centers on four program areas: Education, Health and Nutrition, Child Rights Governance and Child Protection; in addition to having the ability to respond to potential humanitarian situations. All programs in Nicaragua incorporate children’s participation, inclusion, gender equality and resilience and our Every Last Child global campaign as a cross-cutting themes, and prioritize strengthening the capacities of local partner organizations, which include public institutions, non-governmental organizations and civil society networks. Forty six permanent staff members support the implementation of programs between the national office in Managua and our field office in La Dalia, Matagalpa.